A modern history of independent and neutral Turkmenistan has fixed a tradition: if the government does not succeed, for example, the treasury becomes empty and there is nothing to pay many months of salary debts to civil servants, or the intimidated people are on the verge of displeasure, the power impersonated by the president is frantically looking for scapegoats. The victim is usually searched in the immediate surrounding, and like a shepherd who chooses his fattened sheep in his flock, Arkadag also stops his choice on the most fat and well-fed, in the sense of gaining weight and influence having made his own capital - “scapegoat,” which eventually make him shoulder the blame. Such sacrificial “goats” will always be found in a high-ranking “herd” among vice prime ministers, hyakims (heads of administrations), ministers or heads of law enforcement agencies. 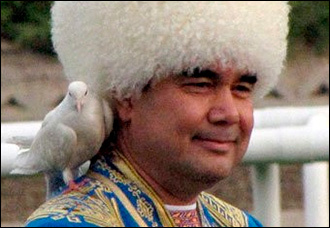 This tradition was invented not by Gurbanguly Berdymuhamedov, but by his predecessor Saparmurat Niyazov, who finding the guilty ones “appointed” them as the source of all the troubles and life problems of the common people. In support of the guilt of these sacrificial state officials, television demonstrated the illicit wealth acquired by them. After all, they were all bribe-takers, like those whom Arkadag (“protector”, the official title of President Gurbanguly Berdymuhamedov today - note by Fergana) finds. The script looks as if was written one-on-one with those made by Turkmenbashi's hand and his assistants: at first there are theatrical resignations and dismissals, then arrests, searches, and at the end - a demonstration show on TV. Here, as a rule, are not high officials with glossy faces hardly hiding their stomachs behind a trouser belt of an official or uniform suit before TV viewers, but accused or even convicted people - looking pathetic with sagging faces and with an overgrown multi-day bristles, repenting all real and far-fetched crimes who swear that they will continue to “not for the life of one!” Pleading for mercy. So, gradually using emotional stultifying clichés TV viewers are led to the thought: now, when embezzler, bribe-takers, and parasites are exposed and suffer a severe but fair punishment, and the goods that they have stolen are returned to the state, a better, more prosperous, richer life expects them. At one time, late President Niyazov did so in one fell swoop achieving several goals at once - he let out steam from the heated public cauldron, deprived all the officials of everything including freedom, and raised his image of the most just ruler in the eyes of naive citizens. Now the experience of Saparmurat Turkmenbashi is successfully used by Gurbanguly Arkadag. In May 2017, President Berdymuhamedov suddenly announced the fight against corruption. This time, high-ranking officials of the prosecutor's office and the Ministry of Internal Affairs were accused of bribery. Prosecutor General Amanmyrat Hallyev was removed from his post and taken into custody. The next step were televised stacks of money in Turkmen manats and US dollars, precious stones, jewellery, gold bars on television. The purpose of this action is clear - to divert people from gloomy thoughts about why they have not been given a salary for three months already, where the money which the administrations of state enterprises and institutions refer is missing, and why the shortage of funds to cover the running costs of the upcoming Asiada affects ordinary people. And here are those who are to blame in country’s misfortune: 14 former prosecutors of the regional and district scale exposed in corruption, the head of the police of the city of Bayramali, the head of the legal consultation of the Baharly district, several executives of the state-owned subsidiaries owned by “Turkmengaz” structures, Association of the Food Industry, a number of enterprises of the “Turkmencement” association of the Ministry of Industry. Heads down, they publicly repent praying for forgiveness and mercy. And the scale of corruption is huge: if only one district prosecutor, as reported by Azatlyk Radio (Turkmen service of Radio Liberty), was caught with $15 million of cash, what to speak about corrupt high-level officials? Undoubtedly, such an emotional turmoil for the ordinary Turkmens reaches the set goal. People forget about their “small” problems for a while, and are permeated with faith in a brighter tomorrow. In the meantime, officials are also seriously concerned about Arkadag's threat of a ruthless fight against bribe-takers and corrupt officials in the law enforcement system. What a stunning proposal the president made about to refrain from applying henceforth humane acts of pardon and amnesty in relation to bribe-takers. Mundane problems become secondary for some time. For the sake of justice, it must be remembered that during his reign President Berdymuhamedov had already prohibited the practice of an early discharge. However, then the ban concerned drug traffickers. Thousands of wholesalers and small-scale drug dealers throughout the country lost the chance to go free before the prison term ends. This step, combined with the tightening of penalties for illicit drug trade and the creation of a special service to combat it, in fact, helped President Berdymuhamedov substantially clean the country and society from drugs. It is difficult to say that this evil is completely eradicated in Turkmenistan, but the dope is not so easy to get today. It seems that the president intends to use the experience of fighting drugs on corrupt officials. In May, Azatlyk Radio, referring to its own sources in government milieu, announced the intention of the authorities of Turkmenistan to create a special body, independent of other law enforcement and power structures, to combat corruption. It was reported that the anti-corruption body, like the now abolished State Service for Combating Drugs, will receive broad powers. On 1 June, President Berdymuhamedov at a meeting of the Security Council approved a hastily drafted State Programme to Combat Corruption and created the State Service for Combating Economic Crimes. Why in a hurry? It can be seen that the degree of human discontent with domestic politics has increased too much and it has become difficult to explain to the people what is happening and who is to blame. It is necessary to transfer the arrows to specific culprits, to convince the electorate that they are to blame and the fight against them will put everything in its place. Naive Turkmens from the provinces swallowed the bait believing that the declared fight against corruption in the country is not a short-lived campaign, but a serious one and for a long time. Surely, the place will be too hot for the bribe-takers now, the villagers are happy and confident that from now on they will not have to bribe the doctor in the hospital for an examination or operation, the teacher at school - for good grades in the certificate, for admission to the university and other “services” each having its “own” fee. Experienced experts and retired senior law enforcement officers say that all this is nothing more than a bluff from Arkadag, and that corruption is not drugs, all bribe-takers cannot be imprisoned without the right to pardon. One of the experts, the retired lieutenant colonel of MNB (Ministry of National Security), said in his personal communication in social networks that until the system of training, selection, and placement of leading cadres is changed, the eradication of corruption would be a feeble attempt. In his opinion, all positions in the country are sold and bought. You just need to know two things - who to bribe and how much to bribe. For example, in the Dashoguz and Lebap velayats (provinces) with the highest unemployment rates the position of a simple cleaner with the office of a state institution costs around $1,000. Give more - the boss will find an excuse to fire the already working cleaner and hire you instead. Approximately the same rates in the traffic police: 1,000 bucks and a driver's license in your pocket. A military commissioner of the district or city for three to five thousand of “greens” can allow your son get away from the service in army. If the military commissioner does not take the money, then the medical commission will easily solve this problem for the same amount of money which will give an opinion on the incapacity of the conscript to serve for health reasons. The higher the position of an official or the more difficult the problem, the higher the price of its solution. In September 2013, the issue of combating bribery had already been raised. Then, two vice-premiers, prosecutors of the regions and the city of Ashgabat, the head of the tax service, and also the heads of a number of leading state-owned companies lost their posts. The amount of the bribe which is taken on the highest levels of power - from 600 thousand dollars was announced. It was exactly the sum that the vice-premier A. Egeleev received from the hyakim of the Serdarabat district in order to take care about his appointment as the head of the regional administration with the president. “Everyone who has a mouth and hands takes bribes,” bribe-givers and bribe-takers say in their defence. He firmly believes that the main corrupt officials sit in the presidential palace and in the government - they are hardened apparatchiks, the “grey cardinals” of the Turkmen establishment, people who have not only constant access to the body, but also a certain influence on the president. They are not public, but they are known in the leading milieu, as the documents of many appointees pass through their hands. They are omnipotent in solving many issues, their opinion is taken into account by the president when deciding on personnel or other issues, everyone is afraid of them, including the chiefs of law enforcement agencies. Their surnames can be read in local newspapers under congratulatory telegrams addressed to the president during the holidays and other important events. “They, like the old roots of teeth in the mouth, have been firmly seated in the presidential apparatus since the time of the Turkmenbashi,” the retired lieutenant colonel said, “the head of state was replaced, but they are still there. And the president-dentist does not dare to pull out this rot. A ram fighting is often arranged at weddings in the northern and eastern regions of Turkmenistan. There are people who just do only that: they feed their pets and drag them to the battles for the main prize of the celebration. And on the decisive day, shouting the command “hur, janavar (animal), hur,” pushing their rams to knock out the frontal impact of the enemy. According to the source, the Ministry of National Security received the “hur-hur” command in May 2017, and the president appointed the prosecutor's office and the Ministry of Internal Affairs as the objects for beating. A crowd since the time of Juvenal demands “bread and circuses.” Turkmenbashi managed to unite these two human desires. The population had free social benefits, cheap food, and enjoyed the harassment and almost bloody spectacles which the ruler arranged and showed on TV from time to time. Arkadag abolished the first part of this popular expression depriving the people of free goods, that is bread, leaving only tomasha - a funny spectacle. The near future will show whether the Turkmens would enjoy it. After the arrest, trial, and confiscation of property of convicted prosecutors, law enforcement and supervisory bodies are panic-stricken. Officials of the tax service, state customs, kazyets (courts), the Supreme Control Chamber, the prosecutor's office, the Ministry of Internal Affairs, the Ministry of National Security, the migration and sanitary epidemiological service, and other agencies are feverishly transferring money and valuables to the homes of their distant and close relatives, including personal goods and real estate. Knowledgeable people state that notaries are working 24 hours a day, they come to some high-ranking state officials at midnight in order to hide the procedure for changing the owner of the property. However, despite the fear, those who have something to lose, adhere to the saying “God helps those who help themselves,” and waiting for the "hur-hur" command, they do everything to pass illegally acquired wealth to grandchildren and great-grandchildren.